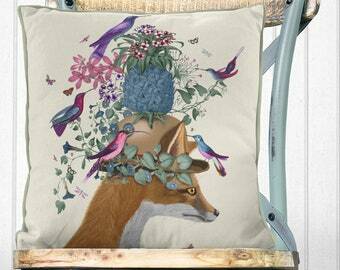 Inject a burst of colour and whimsical beauty into your decor with a cushion from our 'Birdkeeper Collection'. 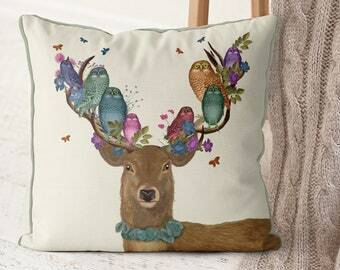 This beautiful collection features a range of country animals adorned with fantastical headwear and exotic birds of all colours and will bring a splash of bright colour and warm summer tones into your room. 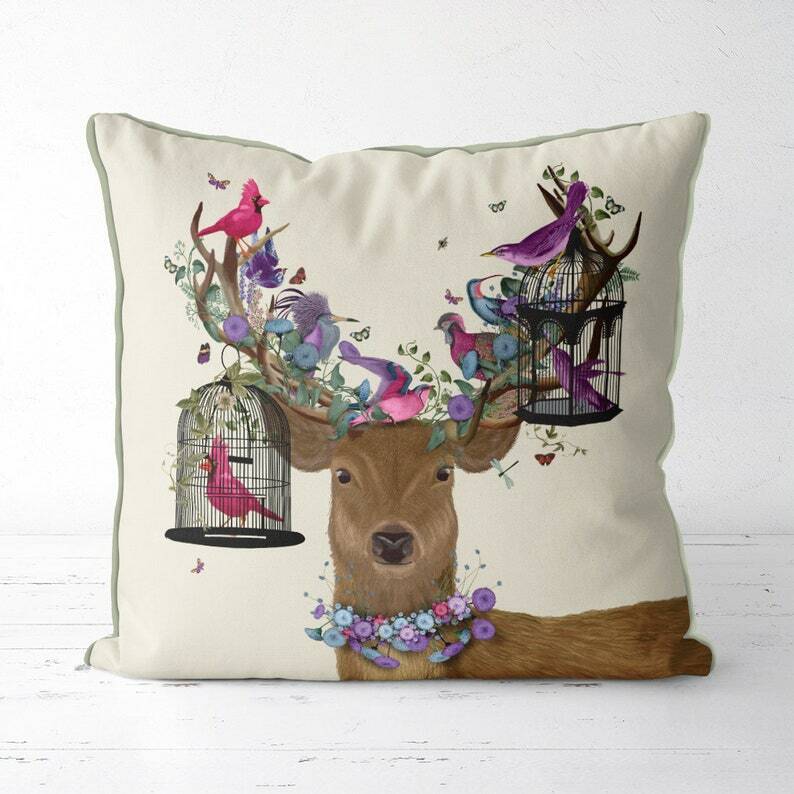 An original illustration by UK artist Kelly Stevens-McLaughlan, these cushions are made entirely in England and are great for snuggling up to on the sofa. But if you can bear to part with it, it will also make a thoughtful and very unusual gift that is long lasting, and is sure to delight the receiver. Exquisitely digitally printed onto a linen coloured background so that you’ll be able to see every detail of the original artwork, our covers all come with coordinated piping all the way round, to give you a perfect finish. Made from lovely quality fabric which is just perfect for you to cuddle, they are perfect for a country home interior or any animal lover. Our covers all come fitted with discreet zip fasteners for easy access so that you can easily wash them. Talking about washing….. yes this cover is fully washable at a low temperature. For UK & EU customers that means 40 degrees celsius. In the US that means 105 fahrenheit. And naturally it's fully colourfast, so the colors of the design will retain their brightness for you. And you can iron it with a cool iron as well. Fabfunky pillows are all hand finished and all of the seams are overlocked. And did I mention the piping? Yes of course I did. At FabFunky we feel that a cushion cover is just not finished unless it has piping on it. We’re sure you'll agree. - Made entirely in England. Shipping to the US and Canada is via Fedex International Priority which means that your cushion cover will be with you within 1-2 days of dispatch and is fully tracked all of the way. Shipping to the UK and EU is via Interlink/DPD. In the UK this is an overnight service. In other countries this can take between 1-5 days. A fully tracked service. © Kelly Stevens-McLaughlan / FabFunky Ltd. All Rights Reserved. Lovely quality and fast delivery time. EVERYTHING AND YES,IT CAME QUICKLY. Yes - we only use courier services to send our items. US and Canada will have deliveries with Fedex on an overnight service. Do you offer wholesale prices to trade clients?